Aegis Ballistic Missile Defense (BMD) System with terminal intercept capability recently received full certification from the U.S. Navy. This newest upgrade to the operational BMD system adds the capability to defeat short-range ballistic missiles as they re-enter the atmosphere in their final (terminal) stage of flight. The system is already certified to defeat longer range ballistic missiles above the atmosphere. By June 2009, Aegis BMD version 3.6.1 will be installed in the U.S. Navy’s 17 of 18 Aegis BMD-equipped ships. Separate from the 3.6.1 installations, the Aegis BMD capable ship USS Lake Erie (CG 70), is being fitted with the next Aegis BMD spiral that includes an improved on board computing capability and the Standard Missile-3 Block IB. The 88 Aegis-equipped ships currently in service around the globe have more than 950 years of at-sea operational experience and have launched more than 3,500 missiles in tests and real-world operations. In addition to the U.S. and Japan, Aegis is the maritime weapon system of choice for Australia, Norway, South Korea and Spain. The Aegis Combat System (ACS) is an advanced command and control (command and decision, or C&D, in Aegis parlance), and weapon control system (WCS) that uses powerful computers and radars to track and guide weapons to destroy enemy targets. 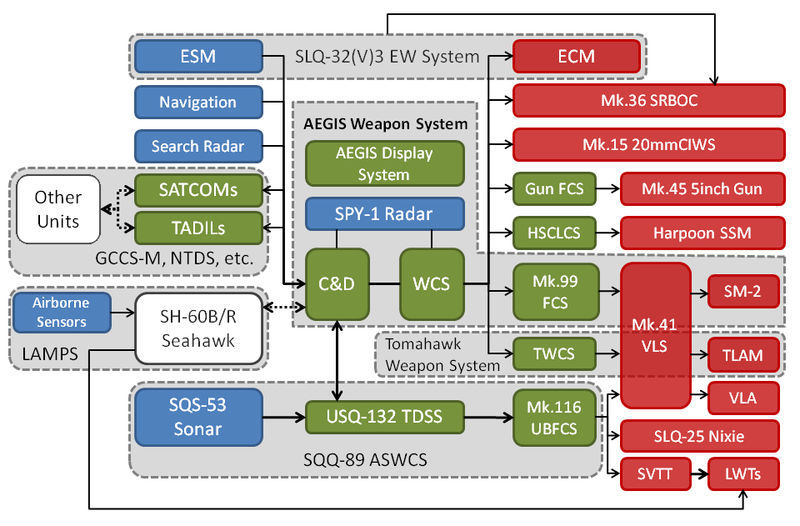 AWS, the heart of Aegis, comprises the AN/SPY-1 Radar, MK 99 Fire Control System, WCS, the Command and Decision Suite, and SM-2 Standard Missile family of weapons. The Aegis Combat System is controlled by an advanced, automatic detect-and-track, multi-function three-dimensional passive electrinically scanned array radar, the AN/SPY-1. The Aegis system communicates with the Standard missiles through a radio frequency (RF) uplink using the AN/SPY-1 radar for mid-course guidance of the missile during engagements, but still requires the AN/SPG-62 radar for terminal guidance. - Сейчас как бы 2014 год и новость несколько устарела, Вы не находите?.. The Nimitz-class aircraft carrier USS John C. Stennis (CVN 74) will be the first aircraft carrier to receive a new network infrastructure designed to improve operational efficiency while strengthening security measures and performance. The US Navy’s Consolidated Afloat Networks and Enterprise Services (CANES) program is designed to streamline and update shipboard networks to improve interoperability across the fleet. It will replace 5 shipboard legacy network programs to provide the common computing environment on board for command, control, intelligence and logistics. The primary goal of the CANES program is to build a secure shipboard network required for naval and joint operations, which is much easier when you consolidate and reduce the number of shipboard networks. That consolidation can also lower costs and maintenance requirements and reduce training needs, if good choices are made. The intent is to build it as an Infrastructure and Platform as a Service (IaaS / PaaS) and field it on a rolling 4-year hardware baseline and a 2-year software baseline. In 2010, the US Navy awarded 2 contracts, with a potential value of $1.7 billion, for the design and development of the CANES common computing environment. Northrop Grumman and Lockheed Martin are competing, and a single prime contractor was expected to be picked in 2011. It took until early 2012, but Northrop Grumman won.